The world of cloud storage and file sharing gets more crowded from today with Facebook announcing the launch of Pipe, the Facebook integrated App to be available from today. Pipe has been in testing mode with a year of invite only and beta status at the Facebook labs. The launch of Pipe adds a new dimension to the cloud and file sharing platform as with Pipe you get to share your files on a peer to peer network from within the Facebook page itself. The app incorporated within Facebook has been developed by a Berlin-based company called Pipe Dream Technologies. Since it is fixed inside your Facebook account, it lets you connect with your friends and share files up to 1GB in size in real time on the social networking website just like that. No hassles, no sign ins or no permissions. You will simply need to drag and drop a file into the Pipe app to send it to a friend. Pipe should be available on the App Center on your Facebook page right now, so you can start sending out files to your contacts today onwards. Pipe establishes a P2P connection with your friend’s computer when both of you are online. The app makers assure that neither does Pipe make use of any servers to establish contact between two computers, nor do your files pass through Facebook. This ensures that there is no third party involved and you can send you private files at no risk. In case a contact is offline and you need to send him or her a file, Pipe will store the file in a locker for your friend to retrieve it later. These lockers however have a limit of 100MB of data but you can make use of as many of them as you like. While Pipe is limited only to desktops as of now, mobile versions of the app seem to be in the works. 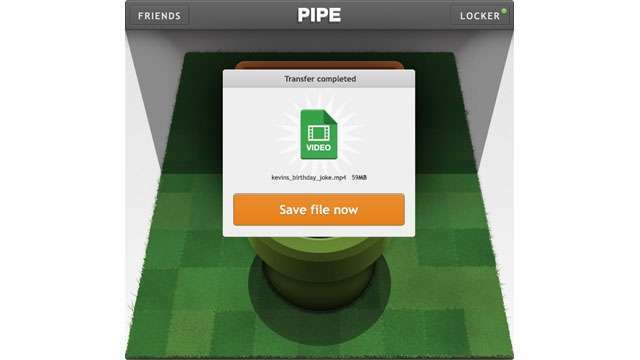 The CEO says that while the iOS version of Pipe is almost ready, an Android version is still being developed. So there you go, file sharing gets a new dimension and now you have the required privacy for sharing your files. Can't wait till Google Drive and Google+ are reverse integrated! !